As an entrepreneur, it’s vital to understand the advantages of technology in small business. Surveys say that small business owners fall behind in modern technology use, while successful entrepreneurs report significant business benefits by employing current technology. Below is a collection of ideas and trends in technology which boosts small business sales and profits. It’s surprising to know that many of the small businesses don’t have a website. It is a threat which kills the company’s visibility. A website is the most powerful marketing tool any business can have. It makes your business to get found quickly. So, a website is necessary for entrepreneurs or small businesses in this digital world. New or returning customers tend to visit business web page naturally. They underestimate your business for not being online. Online business or physical store, you must need a right platform to project your business. A website has the potential to convey your business purpose alongside promoting products and services. 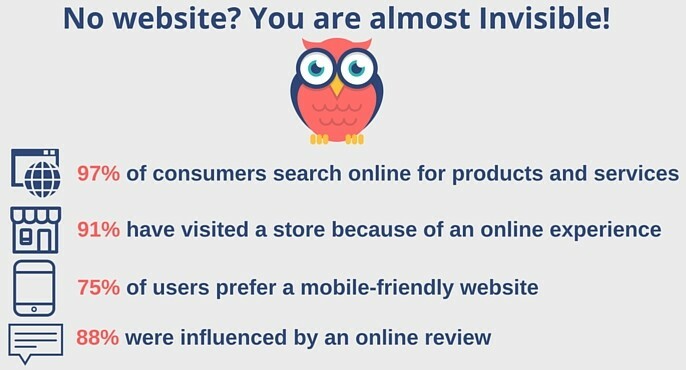 Today, small businesses need an efficient, mobile-friendly website, a substantial social and listing presence, and a clear plan for communicating with their customers online. It is a myth that website is an expensive thing and meant for large corporate organizations. A website is not an expensive thing. At least not All. Don’t judge looking at the sites with hundreds of web pages and heavy graphics. You can go to an ideal website with few pages and simple interface. One of the good things about the website is that the size of your company does not matter really. So build a website for your small business with the following approach. Gather relevant knowledge about your industry and trends. Create the content of the site which attracts and keep netizens engaged with your web pages. Fill website with every useful information about the company, products, services, etc. in appropriate pages. Include your experience, ideology, credentials and passion towards business which make visitors trust you. There are many free content management software available like WordPress & Joomla. So it’s not a big deal to when you want to make it short and straightforward. You can have the same strategy with the blog. Check site traffic every month and analyze your web presence. Fully engaged customers have a strong emotional attachment to a company. It’s a marketing strategy to deliver engaging and entertaining content in their business promotion; so they act as brand ambassadors of the organization. It’s just an assumption that consumers complain a lot on social media. In fact, a study found that customers reached out to social media to compliment a brand more often than to criticize it (50% vs. 35%). You can offer excellent customer service through social media. It’ll be more easy for small business to reach their customers and gain more of them. Facebook, Twitter, YouTube, Google Plus and Pinterest are leading social media websites as we all known. Create your brand pages, make them resemble your website content. Post content with attractive headings. Let the pages lead to your website and increase traffic. Follow up with any comments. Analyze the posts and rate them with popularity. Publish similar kind of posts which get more attention. Do the routine and engage with your customers. Don’t forget, images and videos are powerful in content marketing. Business without website or blog must choose social media for promoting and marketing. Business is all about relationships, how well you build them determines how well they grow your business. 70% of the small businesses are owned and operated by a single person. 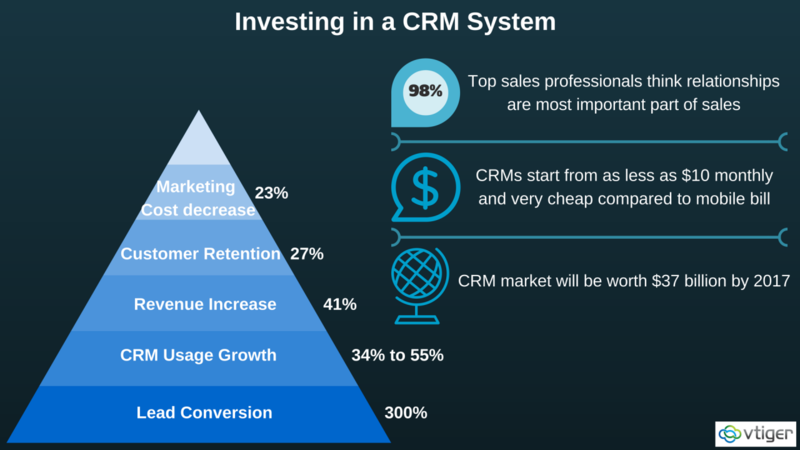 I strongly believe CRM is the secret weapon of their success. So, choose a right CRM like Vtiger, which meant for small business. Starting at $12 monthly, Vtiger is an enterprise-ready software mainly used in small to medium-sized businesses. Our CRM is customer centric which helps to grow sales, improve marketing ROI and deliver excellent customer service. Try Free Trial and experience great small business CRM. Credit card terminal and Online payment gateway are two different payment systems you must offer to help customers shop online or store easily. Not many people carry enough cash these days. So, accepting credit cards is a good step for your small business success. “We accept credit cards” sign adds credit to your business. Credit card payment system is not just making purchases easy, but also making payment process efficient and secure. It results in profits in your business on the fact that cardholders spend more on purchases. Most of the customers prefer online shopping with their convenience to buy products or services with few clicks. Here you need to choose a right online payment gateway to have your online business a smooth sail. PayPal is one of the trusted and leading payment gateways you can go for. Authorize.Net and SecurePay.com are two of similar services. Customers are using different location-based tools to find the businesses nearby. They are looking for a business not by name, but location. So, localize your web presence for maximum reach. 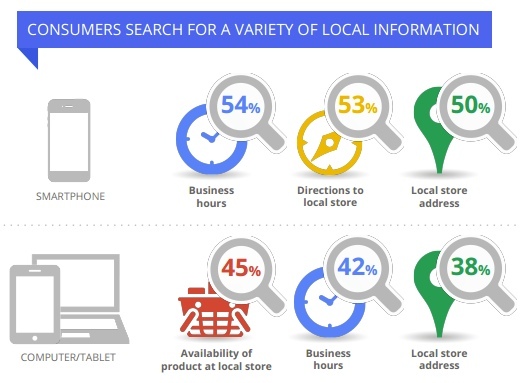 Local search through social media has increased these times rapidly. Add your business in various local business listing services like Yellow Pages, Yelp, Citysearch, etc. Mention exact business type and services or products you offer. Add your location to Google Maps and other maps. Give precise address, timings, directions and contact details. So it will be easy for anyone to reach you physically or through the phone. Include few photos of your store which drags visitors attention to identifying quickly. You will have a decent number of queries which initiates from listing your business in local search. Leading of mobile search in local search indicates us the importance of a mobile-friendly website. We wish you implement the above ideas to increase sales and customer satisfaction which leads to the growth of your small business. We already received many success stories of our clients in CRM aspect. Join us by starting with a Free Trial. We are always happy to help and hear from you. Leave a comment below on your views on this post and share this helpful content with your socials.